Québec City is known for its fabulous restaurant and café culture, so a visit is bound to add a few pounds, but oh so worth it. 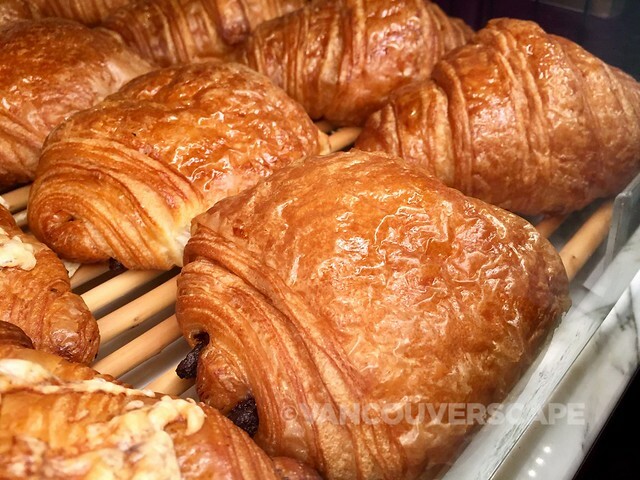 From flaky croissants to decadent cheeses and desserts, it’s easy to become a gourmand here. Food is celebrated in Québec, at lunch and dinner. 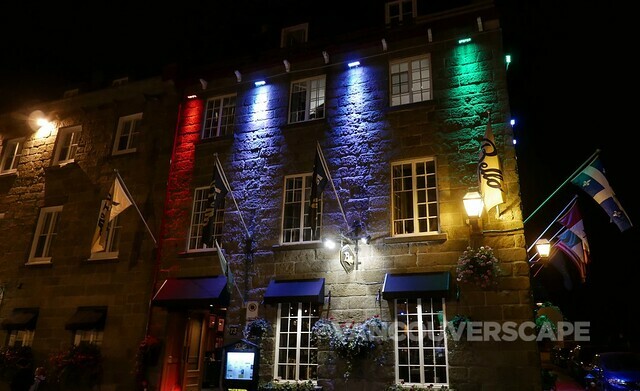 Both Rue St. Louis and Grand Allée are filled with restaurants and since we were based at the Fairmont Le Château Frontenac, it was but a 10-minute walk to this well-visited area at night. But first off, a visit to Québec’s culinary garden. 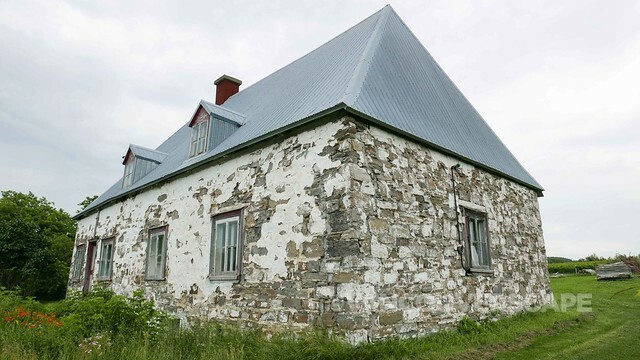 Located about 15 minutes from the city, Île d’Orleans is considered the Garden of Québec. I was invited on a three-hour agritourism tour with Québec Bus Tour, starting just outside Fairmont Le Château Frontenac. Our guide Jaäk Trudel gives us a colourful history of the city as we make our way out of the city in a van towards the island, where old characterful houses and farms are spread out across six villages, each specializing in their own produce and products. 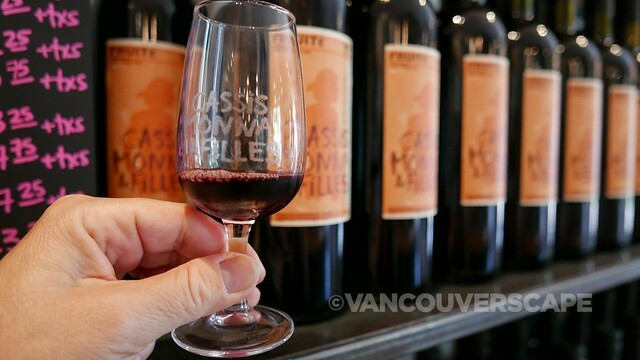 There are five stops on this particular tour: Chocolaterie L’Ile D’Orleans, winemakers Vignoble du Mitan, Verger Joe Giguère, maple producer Relais des Pins and Cassis Monna et Fils. The Chocolaterie is housed in a building dating to 1760 with a charming cafe and ice cream parlour upstairs. 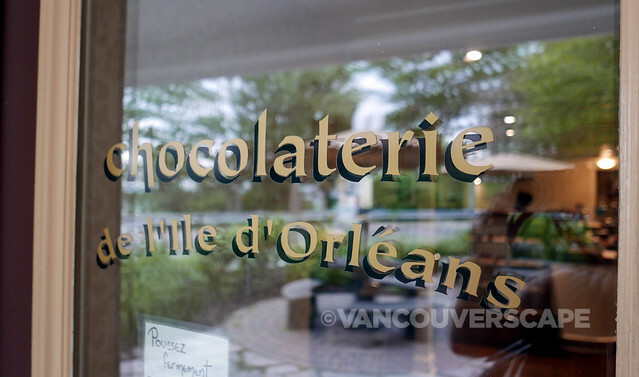 We’re each given a dark chocolate raspberry/maple butter bonbon to savour and get a chance to shop for some of their products before making our way to Vignoble du Mitan. 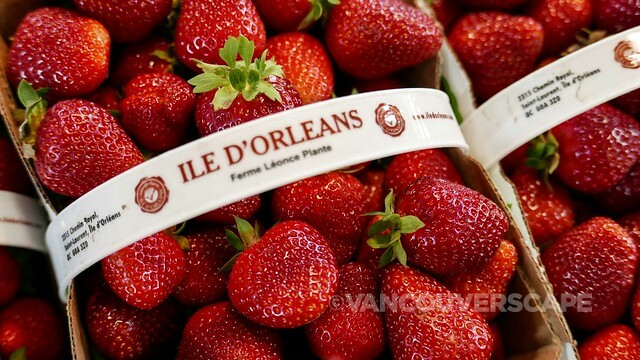 But first, an unofficial stop to sample Québec strawberries: deep red and delicious! 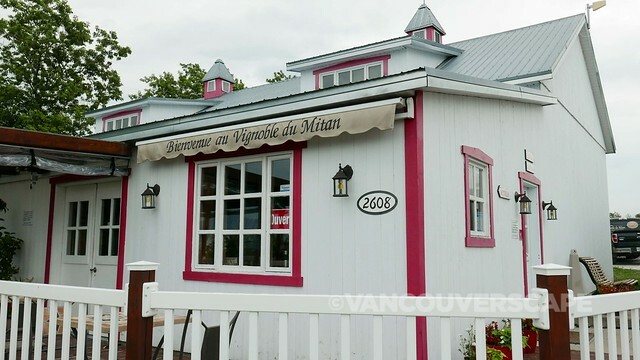 Vignoble du Mitan produces rosé, ice wine and white wines from their 8,000-plant vineyard. The stone house in back dates to 1600 and is used to store reserves from the vineyard. 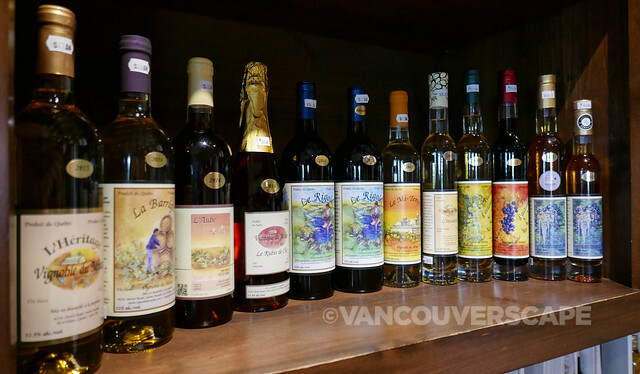 We sample four of their five wines with an option to sample an ice wine (additional cost). Several in our group agree that the L’Aube (rose) is their loveliest with its wild berry aroma and great character. 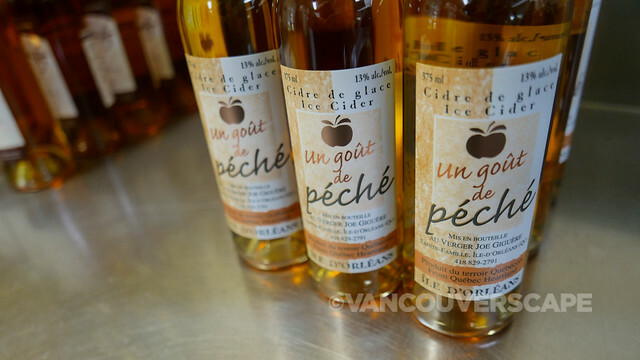 Joe Giguère and his wife have taken on quite the retirement project: creating cider! Over the past 40 years, they’ve planted 3,000 apple trees of 18 varieties plus a few blueberry plants — all on their own. We sample two kinds of cider here. Their small shop sells several other types plus apple cider vinegar. 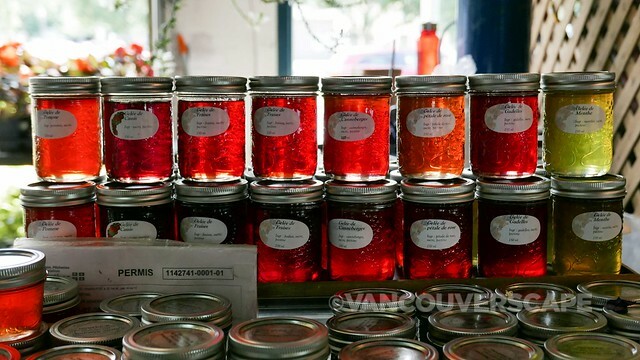 Relais des Pins isn’t in production right now (maple syrup-making months are March and April) but that doesn’t stop them from getting a regular stream of visitors to sample and purchase their maple syrups, jellies and butters. 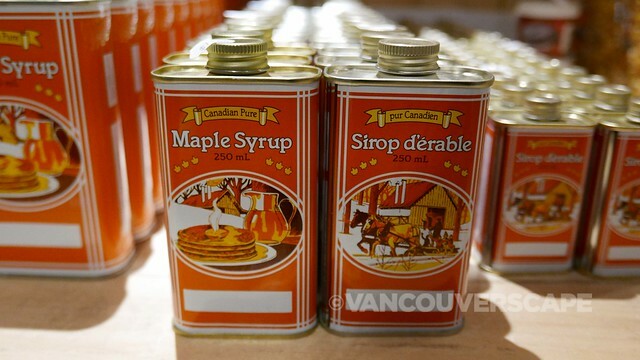 We learn that a large number of farms on the island tap their maple trees for the water that’s turned into syrup. 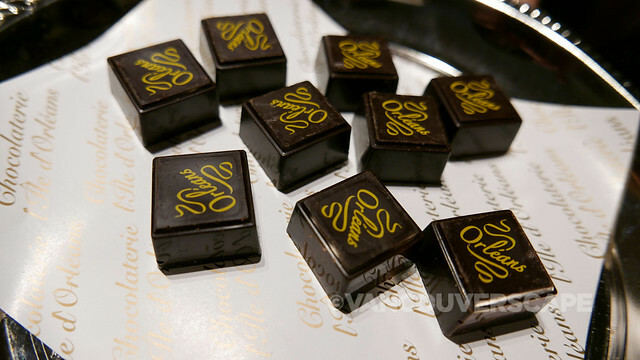 Québec produces 75% of the sweet stuff. To cap off our tour, we stop in at Cassis Monna en Fils where black currant products are the star of the show. Their award-winning creme de cassis is here for sampling as are other black currant products (the black currant honey is divine). Upstairs is a small restaurant where you can order sandwiches, salads and homemade currant sodas to take outside to enjoy on picnic tables and assorted seating scattered on the property. Back in town, our group parts ways with the rest of the tour to visit the Marché du Vieux-Port, the city’s cooperative farmer’s market in business for 30 years. 70 members bring their local produce, flowers and products here to sell daily (the market is open every day except for Christmas and New Year’s Day). The small restaurants onsite sell meals using products from the market, giving visitors here a real local experience. The market has plans to expand to a new location in a couple of years but for now they’re right at the harbour, close to the gorgeous train station built by the Canadian Pacific Railway in the same style as the Frontenac. Le Chic Shack (15 Fort Street, a two-minute walk from Fairmont Le Chateau Frontenac) is the spot for beautiful burgers parked on brioche buns, fries, salads plus poutines done five ways. Because if you’re going to indulge, let’s face it: Québec’s the place to work out your calorie allotment in poutine and pastries. The restaurant was featured on Season 3 of Food Network’s You Gotta Eat Here! and is the brainchild of Lucy and Evan Price, the brother and sister team that are partly behind l’Auberge Saint-Antoine and Musée du Fort, next door to the restaurant. La Braisée contains red ale-braised beef, Parmesan, cheese curds, pickled onions, horseradish aioli and fresh herbs. You can also go with La Fumée, La Forèstiere, La Masala, or go simple with the La Classique poutine. Alcoholic sodas, signature cocktails, boozy milkshakes, Canadian wines and Archibald Microbrasserie’s craft beer is all here to sip and savour. Sodas are made with real fruit purée, too. 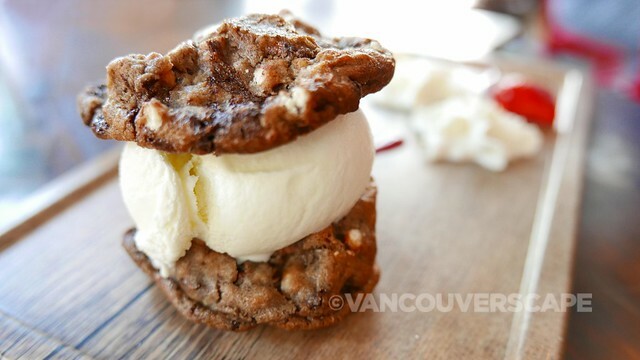 If you’ve got room left from all that goodness, the kitchen sink cookies are Lucy’s creation (I had the pleasure of chatting with her over the merits of cookies one early afternoon), especially wonderful when it plays the starring role in an ice cream sandwich. I wound up lunching here three times during my stay, the food was that good (I’ve tried their salads, Le Chic burger, La Classique poutine and that decadent ice cream sandwich). 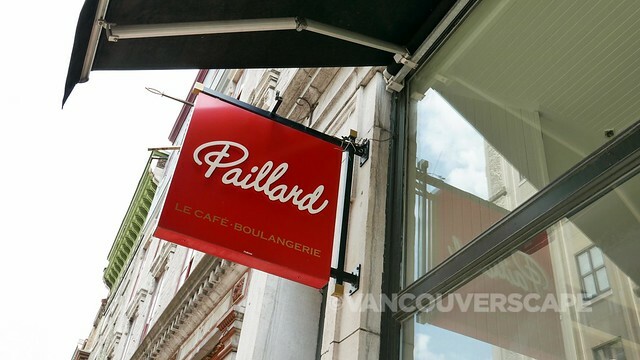 The city’s vote for best croissant since 2010 goes to Paillard, a classy Café-Boulangerie at 1907 Rue St. Jean. Since I’d already eaten their croissants and pain au chocolat at Hotel Le Germain, I opted for a vegetarian sandwich on freshly-baked ciabatta bread while there. Open since 2006 in the city’s heart, this place is an institution. Cafe Du Monde is a great spot right on the harbour. I enjoyed a dinner here while based in the Lower Town. 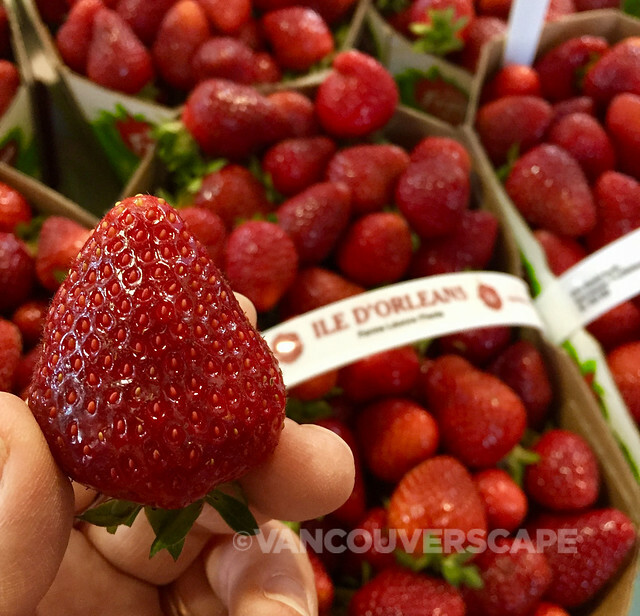 They’ve got some fabulous rotisserie chicken sourced from Les Voltigeurs Farm and if you’re visiting in summer, make sure to order anything that includes those fabulous Québec strawberries! My arugula and spinach salad (served with goat cheese, candied nuts and strawberries) was just the ticket to refresh on a warm summer evening. 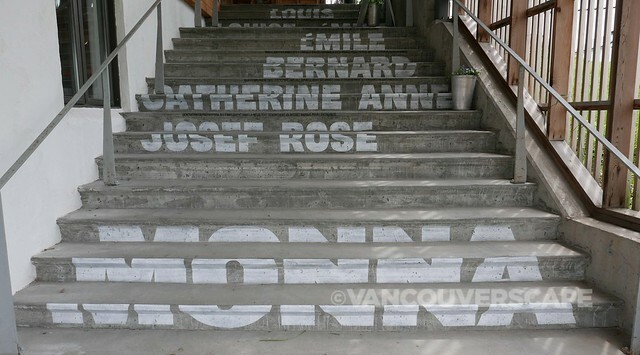 They’re located at 84 Rue Dalhousie. You can’t go wrong with one of Bello’s risotto dishes (there’s 10 to select from). The Risotto di Capesante (with giant scallops, saffron, tomatoes and spinach) was my risotto of choice. If you’re an antipasto fan, you’ve come to the right place. Their meat is high quality and locally-sourced. Bello’s Arancini alla Siciliana is another winner to start off your meal here. Pizzas, pastas, tartares, seafood and meats offer something for every palate. Discover this lovely space at 73 St-Louis in Old Québec. L’Atelier is a fun and lively spot on the Grand Allée Est (at 624) with a focus on cocktails and tartares. 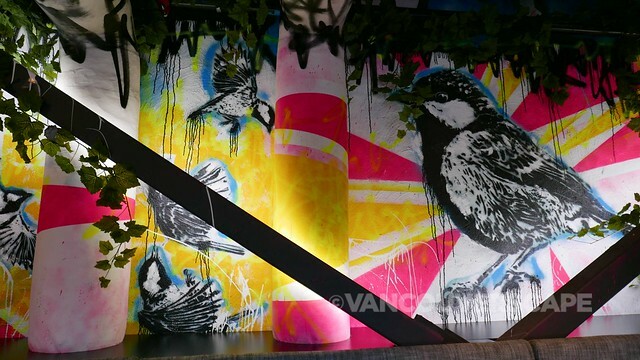 The restaurant spans a couple of levels and the interior is colourful with a relaxed vibe. Tapas, burgers, salmon gravlax, beef carpaccio with oysters and the daily catch are just a few of the dishes on offer. Though I’m not a tartare fan I much enjoyed the gravlax starter. Their cocktail list goes on forever, offering vintage, classic, fancy, twisty, bubbly and sharable cocktails served in a carafe. This is definitely a destination spot for boozy lunches or dinners! 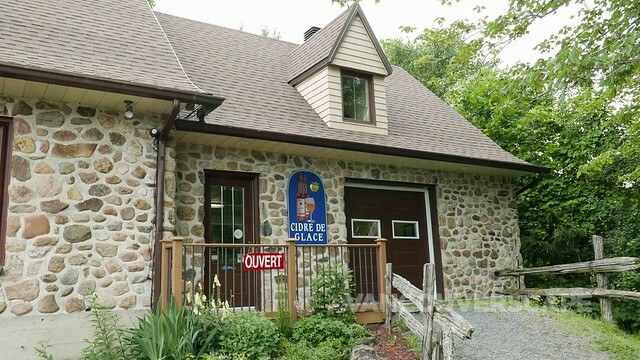 My meals at Bello, L’Atelier and Le Chic Shack as well as the Québec Bus Tour to L’Île d’Orleans were courtesy of Québec Tourism. Opinions, as always, are my own.